Kudos to whoever is running the Microsoft Teams team. Teams is really taking off. Everyone in the partner community that I’ve talked to that is using it is pumped up about. We see clients adopting it. We’re even using it to help manage Dynamics 365 implementation projects with external organizations. One great thing about Teams is the ability to pull different applications into it. 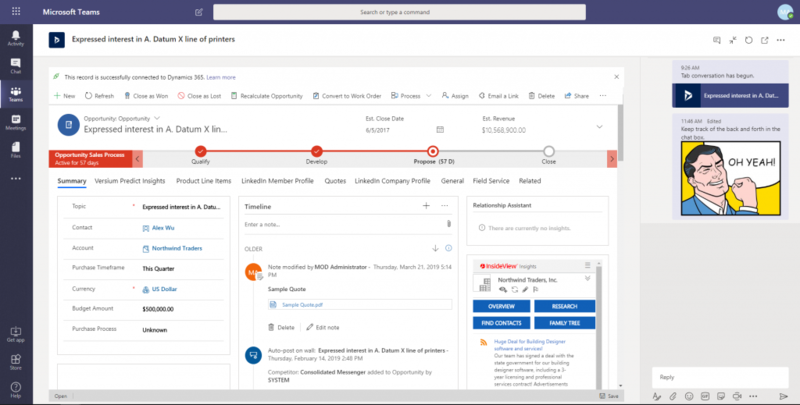 For instance, we can bring Microsoft Dynamics 365 Customer Engagement entities into Teams. 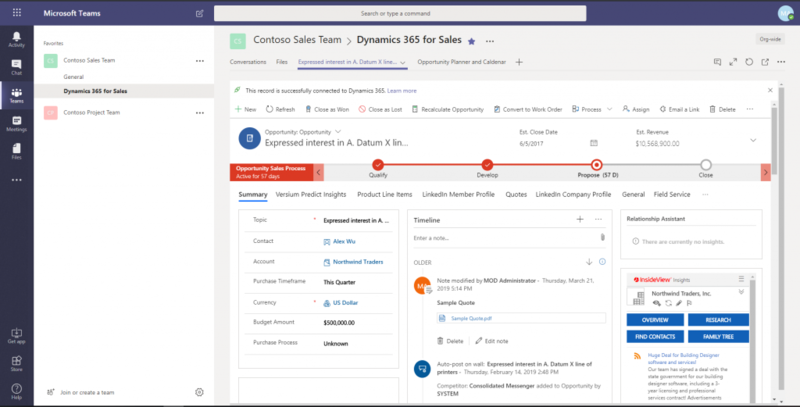 Think about sales collaboration using Microsoft Dynamics 365 and Teams. I see this as useful in a scenario where multiple people are working on say, a critical opportunity. Yes, there are collaboration and workflow functions within Dynamics 365 that facilitate a teamwork approach. I get it. But bringing a critical opportunity into the proximity of other tools for planning and calendaring makes a lot of sense. In a collaborative Teams setting you’re more easily able to manage conversations, files, and tools in one workspace via SharePoint, OneNote, Planner, etc. Initial Microsoft Dynamics 365 and Teams set up isn’t hard at all (assuming you have the proper licenses). I managed to do this in a couple of minutes. User-level stuff honestly. In a demo environment, I created a Contoso Sales Team. Added members to my Sales team. 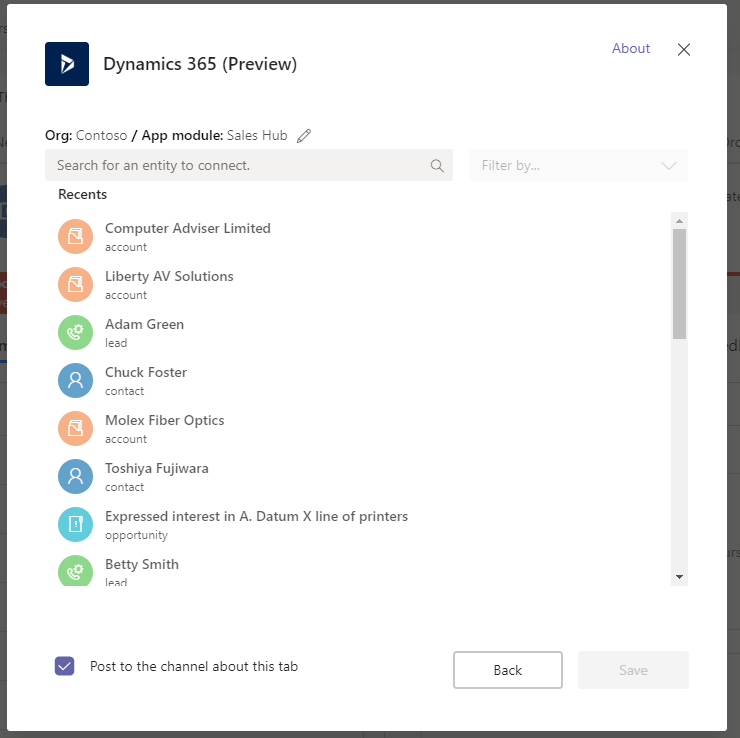 I added a Teams Channel specifically for my Dynamics 365 app. 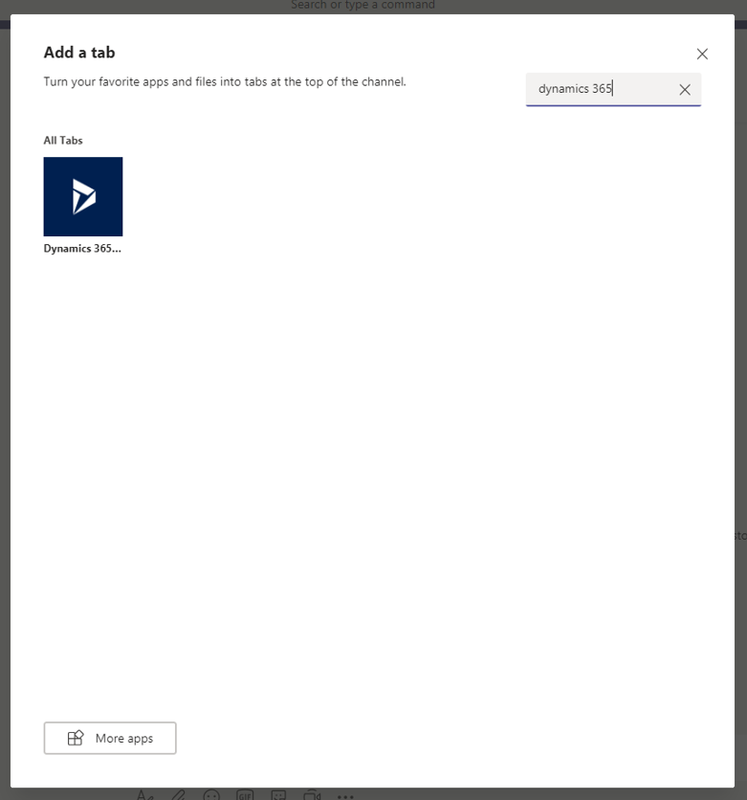 Click on the + button to add your new Dynamics 365 “tab” and you’re presented with a bunch of apps that you can pull in. 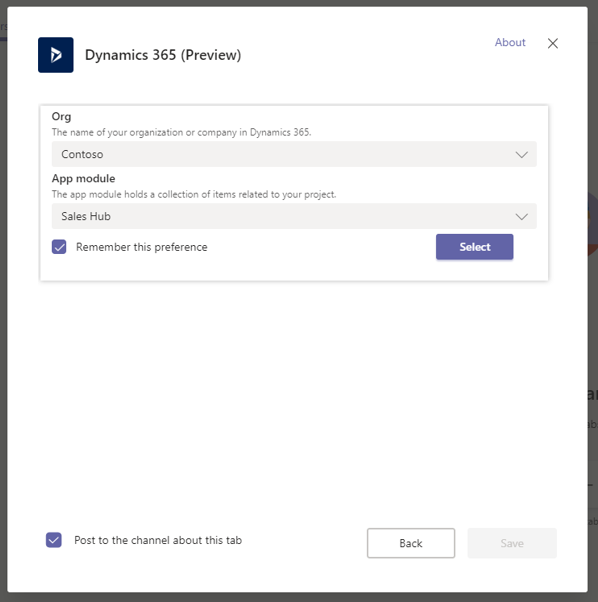 Search for and select Dynamics 365. At this point you’re going to select your Dynamics 365 organization as well as the Unified Interface app you prefer. The next step is to choose which individual record you want to collaborate on. Now select the record you want to collaborate on in Teams. For the sake of this blog, we’re going to use “Expressed interest in A. Datum X line of printers”. After a few seconds, the record appears within your new Sales Team channel with all the other Teams pieces and parts you want to use. You’ll see in this example I’ve added “Opportunity Planner and Calendar”. This will allow me to assign and track individual tasks and due dates among my colleagues. In addition to the Planner, we can track all the back and forth conversations in the chat tool on the right. We can associate files with our opportunity in the Files tab. These will be stored in SharePoint and accessible using your Documents button in Dynamics 365. Keep in mind that this is the actual opportunity record, so as we update fields those updates are reflected in both the standard browser view and mobile app. If we want to launch our browser version – no problem. There’s a button on the upper right that will do that. We are pulling specific records into Teams, not the entire Dynamics 365 Sales Hub. This functionality is in preview — so expect changes. You may need your admin to enable this functionality for you. Some features mentioned only available in North America. So, try this out and have some fun with it. 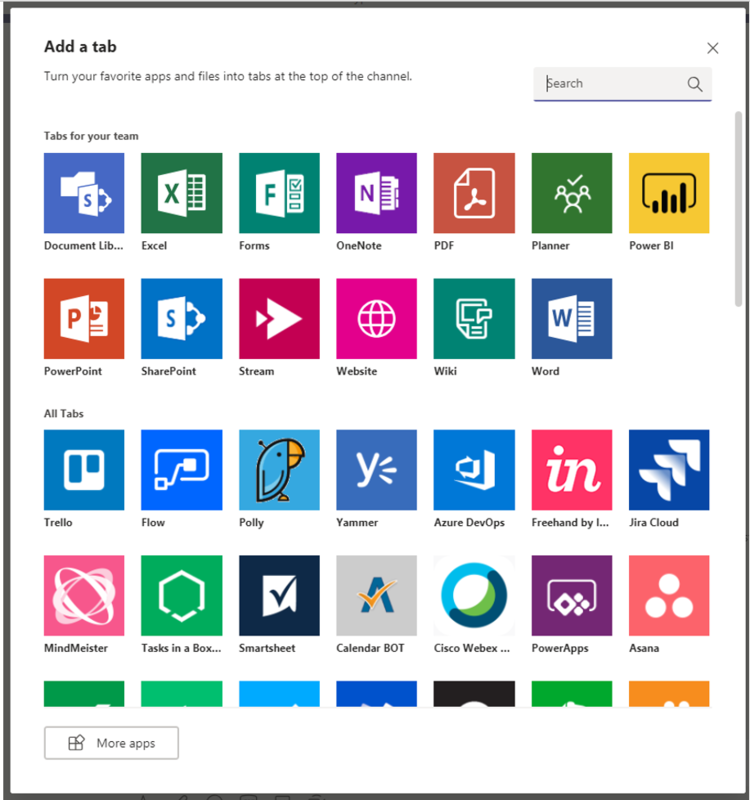 Teams is bound to become an organic part of the Microsoft Cloud productivity conversation anyway – so be prepared.